This Saturday August 27th: Fundraising Party for FMPGC. Make sure you have booked your tickets. Around 150 sold so far! Click on the image to see the details. 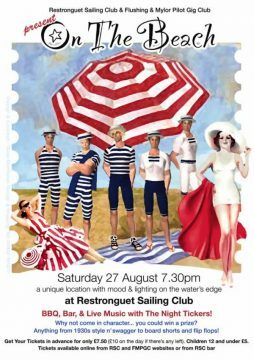 Get your tickets online via the Restronguet Sailing Club website. Go there, click on the Party invite image. Then you’ll need the login information which was sent to members via email. Or contact Celia, Dave Matthews or Steve Hutt for a reminder.